You’ve likely heard the story that it took Thomas Edison 10,000 tries before successfully inventing the lightbulb. Some would consider that a lot of failure on the path to eventual success. He didn’t appear to take it that way. In fact, I’ve heard his response was that he hadn’t failed 9,999 times, rather, he had discovered 9,999 ways NOT to make a lightbulb! To me, that speaks of a pretty positive attitude; certainly one who would not be daunted easily by what some might consider a set-back. Or what about the scientists at 3M who invented Post-it Notes. The story goes that they were attempting to create a sticky glue substance, not one that held lightly for a while, but was easily detached. Was what they discovered a failure? Not by a long-shot! While they weren’t immediately successful in creating what they had set out to create, they created something extremely useful and valuable. I’m sure 3M would say this “failure” was worth billions, literally! The key is how we choose to look at and respond to the things that happen to us. I’d say these two examples demonstrate some folks who have chosen to approach their lives and work with a positive attitude. Two weeks ago, I was in Orlando, Florida, with the John Maxwell Team, and we were blessed to have Nick Vujicic with he. He spent a considerable amount of time sharing his story with us. If anyone were to have an excuse for having a negative attitude, Nick would likely get a pass. He was born without arms and legs. Today, at 30, he is happily married and has a 6-month old son. He travels the world bringing awareness to a variety of issues that touch his heart, motivating others, and displaying the value and fruits one may harvest if one faces life with a positive attitude. He swims, has been surfing, sky-diving, and, again, travels the world. He has an undeniable zest for life and is not willing to let anything stand in the way of achieving his heart’s desire. If you ever have the chance to see or hear him speak, I highly encourage you to do it! His attitude is contagious in a very good way. Personally, he is a reminder to me that very little in life is truly impossible. His story reminds me that although I will face adversity in my life, and I may not be immediately successful in everything I endeavor to do, there really is nothing holding me back except for me. I find, it’s an effective attitude adjustment. Today, as we begin these four weeks focused on attitude, it’s good to have a baseline to measure from. Take a close look are your attitude in both your personal and professional lives. What is working well for you? How is your attitude impacting the people around you? As John Maxwell often says, in every relationship, you have the opportunity to be a plus or a minus. What do you choose? Well, we’ve spent the last four weeks focused on Legacy…what you leave behind, how people think and talk about you, when you are gone. Now, this may simply be because you’ve taken on a new role, left the organization for a new position with another company, or have passed away. We’ve learned, by example, that you have the power and ability to design your legacy; you can influence what you want it to be. What if you had the opportunity to know what it would be…would you be likely to make changes in your direction or behavior? Let’s look into the story of a man who unexpectedly had just such an experience! In 1888, an infamous Swedish industrialist received news that his brother, Ludvig, had died in France. You can imagine his dismay when he read the obituary and discovered the editor of the paper had mistaken his brother’s identity for his own! The headline read, “Merchant of Death is Dead.” The obit went on to explain how the man had built his wealth through the invention, manufacture, and sales of dynamite. He was considered a heartless profiteer for having introduced the world to such a devastating innovation. While it’s not likely any of us will have this same experience, but we do have the opportunity to increase our self-awareness and become aware of the legacy we are building. If we choose to do it now, we have time to make changes if what we learn is not in tune with what we desire. What do you know about how you are perceived, about what people think and say about you when you are not there? Is it in line with how you wish to be remembered and talked about? If not, it’s not too late to make a difference. *From the Intentional Leadership booklet, by Giant Impact. What window are you bumping up against? 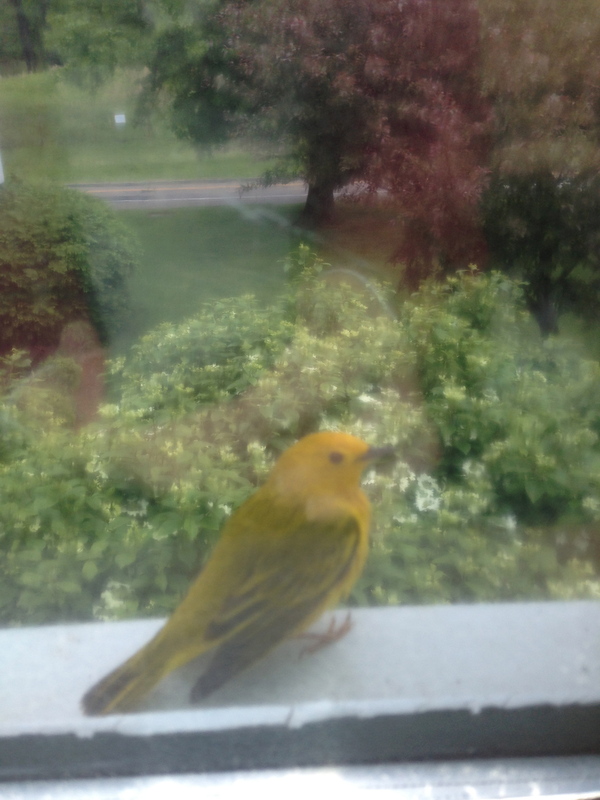 This beautiful bird spent the better part of four weeks fluttering up and down this window. You see, it thought it was flying into a tree. And it was persistent! It literally fluttered up and down this window most of the day; occasionally flying off into the trees you can see beyond it. The window has reflective film on it, to keep the heat of the sun out of the office. If you look at the window from the outside, you see the trees and bushes (which you can see as you look beyond the bird in this photo) reflected in the glass — pretty clearly, too. No wonder the bird thought it was flying into a tree…and behaved in a frustrated manner that it couldn’t get into the tree. It’s perception was that the window was a tree, and so it continued to try to find a way into the tree, because that was its reality. Clearly…it wasn’t a tree and the bird was unsuccessful! This is one of the key concepts I teach when I’m teaching communication skills. It fits in nicely with my two key lessons — self-awareness and intentionality are key to your success. Understanding the power of perception is important because someone is always watching you, especially when you are a leader. And they make up stories about what’s going on based on snippets of information — often incomplete — combined with their beliefs, values, past experiences, and rumors. What they come up with may be accurate, close to accurate, or a million miles away from the truth, but because they don’t have access to the whole story, the one they create makes sense to them, and they move forward based on it. My question to you is, how is someone’s else’s perception of you affecting your performance and chances of success? How is it impacting your relationships? What about your own perception about yourself? About your abilities, skills, and talents? This quote says it all. What you believe to be true about yourself will determine your future. Knowing that, it’s important to examine how you perceive yourself and understand why it is so. Then, what can you do to make it different, if you need to make some changes to move forward into your potential? And, what perceptions do you have about others that may be affecting your path forward? Please, don’t waste your time and energy fluttering up against a window that is NOT a tree, and expect it to magically become what you want it to be! Make the effort to have clear vision and understanding about who you are and what’s going on in your life…and then move forward with confidence! Passion is powerful; we all know that. And it can be a force for good or a force for … well, not so good! The same passion that can make you the best in your field can also result in an insufferable ego! Often times, when we are really passionate about something, we can be easily offended when someone disagrees with us or offers a different perspective on the topic. I can say, humbly — I hope, this has happened to me. I strive to be more self-aware, however, and understand that it’s ok for others to have another perspective and that they don’t necessarily share my passion. Today, think of someone who may have offended you as they touched upon your passion. Starting today, take a step to repair that relationship. One of the most profound ways to keep passion grounded on principle is through humility. 1. Contact the person and begin reconnecting. Before you take this step, however, it’s important that you forgive them and approach the connection with an open heart. 2. Write the person a note and mail it today! Acknowledge your part in whatever happened and ask them for their forgiveness; tell them you value the relationship and want to repair it. As you drop the note into the outgoing mail box, tell yourself that you forgive them for their part. Truly let go of the conflict as you release the letter. I can say from experience, there’s something very liberating in this process. It may not always end with the relationship repaired and things between you back the way they were…but you will feel better for owning your part, for making the move to begin the healing process, and for having some closure of the situation. If we begin with the premise that excellence requires superior quality, first we must define what that means…to ourselves and to our customers — both existing and potential, and for each of us this may be very different. For me, it requires ongoing education and keeping up with the latest developments and thought-leaders in the areas of personal growth, leadership development, team building, and communications. It means being solely focused on the success of my clients. It means being an outstanding listener — which we all know is an active process, requiring my undivided attention and ability to tune out my own thoughts as I listen to what my clients need to discuss. It means functioning intuitively and perceptively to discern what the true issues and challenges are that my clients face. All of these things will allow me to tune-in to my clients and really understand their unique needs. Then I must be able to tailor what I have to offer to be able to actually help them move through, around, or past these obstacles and challenges to perform at higher levels and achieve their goals. There are a lot of other factors at play here, other actions I need to take, other behaviors I need to demonstrate, as you can imagine. But for purposes of getting your thinking started, I think this is a good beginning place. Clearly, your inputs and outputs are likely very different than mine, but the thought processes around what excellence means and how you demonstrate it are the same. What edge could your organization gain by committing to, and delivering, superior quality…at a level higher than that of your competitors? In what areas are you already known for superior quality — at your team’s level or for that of your entire organization? Today is another day for reflection. I encourage you to spend some time journaling about what you learned through your colleague, yesterday, about external perceptions of your skills in building the foundational elements of relationships. How can you use this new insight to help you improve? When you are done with that, shift to thinking about the people you lead or interact with regularly. In each of the foundational areas, write down an action step you can take to promote these behaviors and strengthen your relationships. Now, we know that if we don’t make these actions a priority, they won’t likely get done. So, let’s look at your schedule…fit these actions into your schedules on specific days and times. You will have a much greater chance of success then. After all, your calendar is one telling measure of what your true priorities are. Armed with your clearly defined vision, the plans you drafted last week, and your evaluation of your preparation from yesterday, it’s now time to get some feedback from trust colleagues or confidants. As we all know, others often see us differently than we see ourselves, so it’s always good to get some insight from others. Today, find two or three people who know you well, and are familiar with your work. It’s critical that you have sound relationships with these folks, because you need them to tell you the truth. Ask them for their thoughts on what would happen with your team or organization if you were to leave; would the team/organization be able to carry on successfully without you? Do they understand your vision well enough to continue driving toward it? Are they committed to your vision such that they would continue to pursue it, even if you weren’t there to lead them? Have you equipped them well enough to keep moving forward without you? What are your answers to these questions? How do your answers fit with what you heard from others? First, I’ve often thought it a sign of an effective leader that his/her team or organization is fully able to carry on the business of the organization in the leader’s absence. It says the leader developed a strong team, provided clear guidance and expectations, equipped the team with the resources it needed, and is able to leave them to their work, knowing all will be well. Second, having this kind of conversation with trusted colleagues will tell you a great deal about how you are perceived and the effectiveness of your leadership — provided you have developed trust-based relationships with them, so they will tell you the truth, even if it is uncomfortable. Third, if the team/organization would continue to pursue your vision in your absence, it says the vision truly speaks to the others and they haven’t been “following” you simply because you have a title, position, or authority to make them do it. As I often tell the leaders I coach, the higher you rise in an organization, the less likely you are to get the kind of candid feedback about your performance from those around and below you, and the more you really need it. And when you receive it, consider it a gift…just listen. Say “Thank you.” Reflect on what you heard. Follow up. It will make you a better leader.